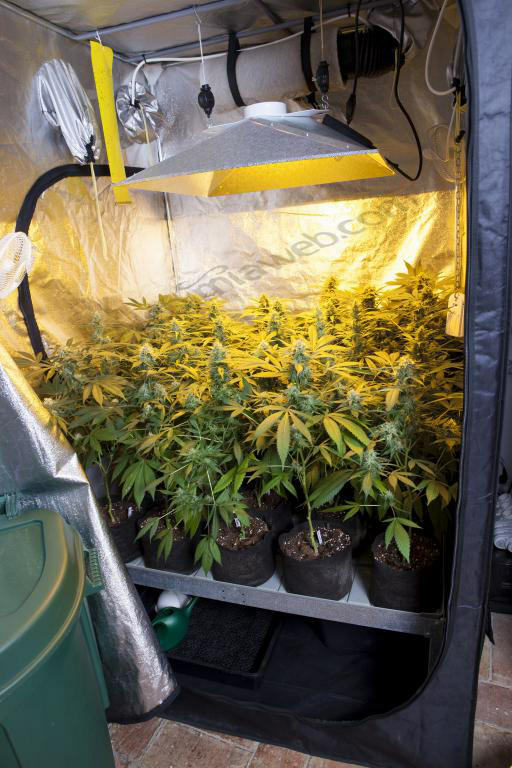 In this article we’re going to explain some basics about indoor cannabis cultivation in grow tents, one of the most popular options among those who just want to grow some pot at home for their personal use. Being highly versatile thanks to the wide range of available dimensions, you only need to keep several factors in mind to successfully harvest your own buds. 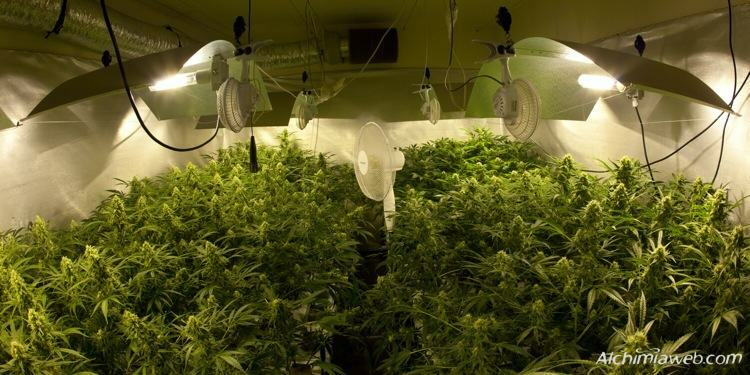 The lamps should be 50/60 cm away from the plants (with 600 watt sodium lamps), 35/40 cm away with 400 watt sodium lamps, and should be raised as plants grow, always maintaining the same distance from their tops. During the growth period, marijuana plants need 18 hours of light and 6 hours of darkness for a fast and healty developement. This phase should last for a minumim of two weeks or until the plants are about 25 cm tall. 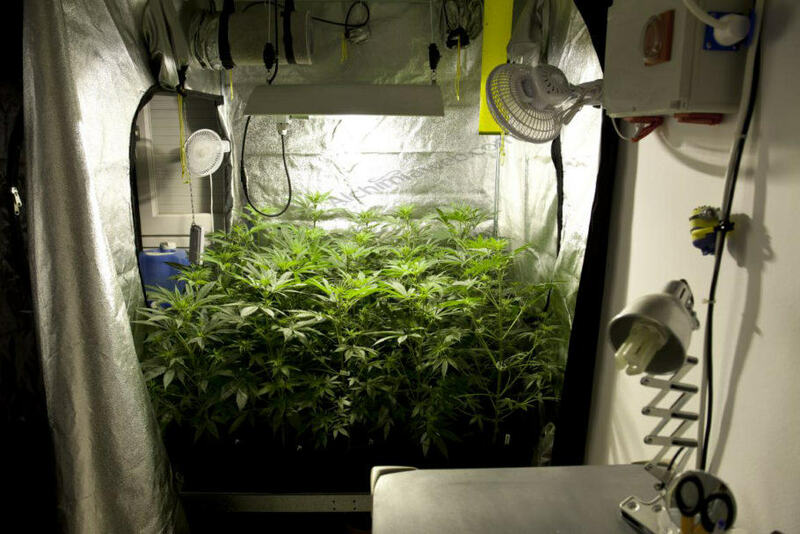 During the flowering period, marijuana plants need 12 hours of light and 12 hours of darkness (it is very important that plants are in total darkness). The length of the flowering period varies from plant to plant and it ranges from 50-70 days, depending on phenotypes. Normally, growers use HPS lamps, LED panels or LEC CMH lighting kits for this stage. The extractor fan must always be connected when the light is on. During the dark phase it should be connected during 15 minutes every hour, and during the last weeks of flowering you should increase this period to 15 minutes every half an hour. If humidity levels reach 90%, then the extraction fan has to be connected continuously. It can act as “passive intractor” when temperatures are moderate, when we don’t need an intractor fan. 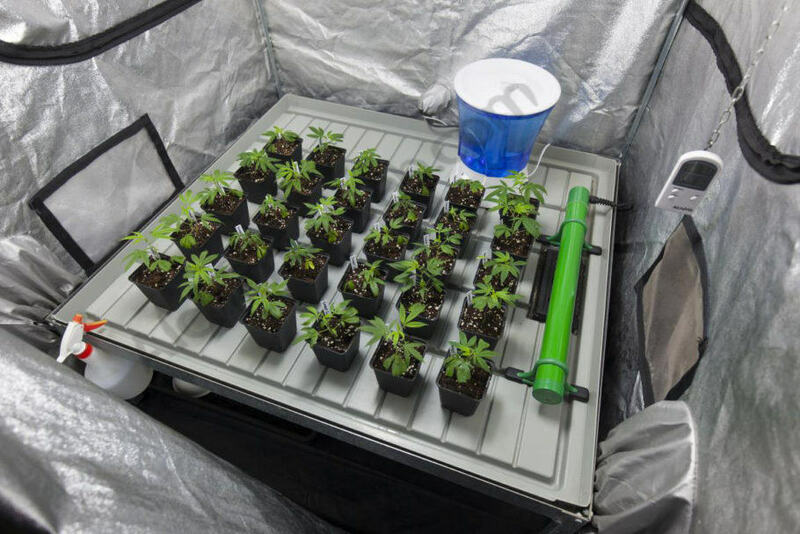 The temperature in the grow tent should not exceed 31°C (maximum temperature) and should be above 17ºC (minimum temperature), although the ideal temperature is between 20 and 28ºC. Relative humidity should not exceed 75% (maximum) and should’t be lower than 20% (minimum). The ideal humidity is between 40 and 60%. Sometimes it can exceed 90%, what shouldn’t be a problem if it happens only in particular occasions. A thermo-hygrometer is necessary to control these parameters in our growing space. Marijuana seedlings need an abundant watering once they have been transplanted (½ litre per plant). A few days later, 150 ml of water per plant and day will be enough. A sprayer can be of great help. At the start of the flowering period irrigation should be increased to 250 ml per plant and day. During the last two weeks of flowering you should give your plants 150 ml of water per plant and day. Before each irrigation, touch the potting soil. If the soil is still moist, wait for the next day to water again. These instructions are just guidelines to help you find the optimal irrigation for your plants, which will vary slightly depending on several factors like temperature, pot size, etc. Fertilise the plants every two irrigations, i.e. using tap water one day and nutrient solution the day after. Fertilising should be done according to the dosage and feeding schedule recommended by the manufacturer. To avoid pests and diseases , it is advisable to treat your marijuana with pesticides, including insecticides and fungicides . 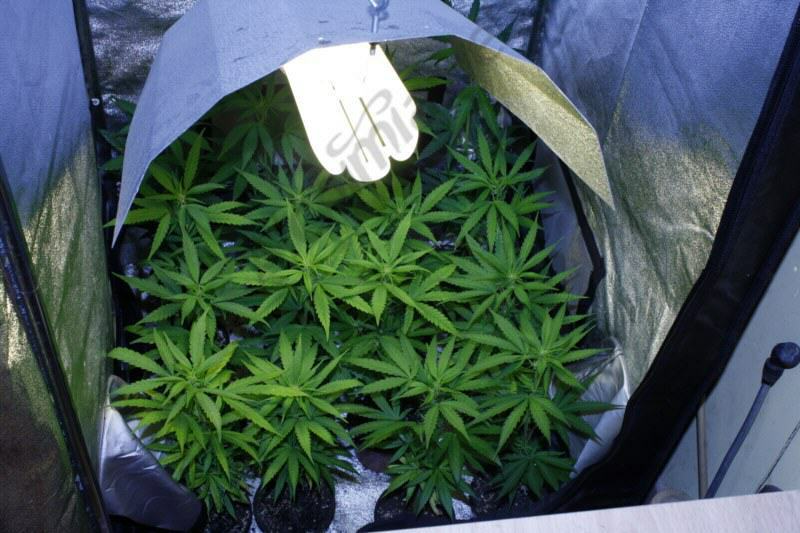 The first treatment should done one week after the plants are in the grow tent, and the second treatment should be performed when the plants are one week into flowering. In my experience, a wing style reflector is the worst choice for tent growing, they seem to be better for more open spaces. Earlier on in my growing career I was using LED’s, near the end of that I had an HPS user friend of mine jealous of my results with them but, in the end, replacement costs were just outrageous compared to just replacing a bulb, or even a ballast. So, when I decided to switch over to HID lighting I bought a kit for my HPS set-up that included a wing reflector. I HATED that thing, the heat build-up in my tent was ridiculous, I had to dial my 600w ballast back to 50% power to try and keep it under control. By my second crop with HPS I had an enclosed reflector with my exhaust fan ducted to it to draw the heat out directly from the source. HUGE difference. I was able to bump back up to my full 600w and heat hasn’t been an issue ever since. But, also bear in mind that I’m using duct fans, not inline fans, so granted my fan may have just not been powerful enough to keep up the other way, though it seems to have plenty of pull to me. And by the way, I definitely get better results now with my HPS than I did with LED’s, I guess my friend is just a step behind. But anyway, to me, the enclosed reflector that you can duct your exhaust fan to is far superior to a wing for tent growing. While I haven’t used duct fans but inline fans, I’ve also realized that the difference between wing reflectors and enclosed reflectors is huge, not only speaking about light reflection, but especially heat dissipation. One thing to avoid whichever style of reflector you use is the ones that have a smooth reflective surface. The smooth surface doesn’t reflect light evenly and can cause major hot spots. The dimpled surface reflectors distribute light much more evenly and eliminate hot spots. Reflectors should have their own discussion here, there are lots of points to be made on the subject. And I’m glad you like reading my opinions Dani, because I usually have one. :^]_~ Best to you! I’m preparing to purchase my first grow tent but am unsure as to the size I will need. I bought a 400w hps bulb with air cooled reflector. I only need enough yield to supply my husband and i with a big enough harvest to last until next harvest which is usually around 4-5 oz. We have been growing with CFLs in our closet and i wanna make sure we use our money wisely when purchasing a tent. We have 3.5 gallon containers. If i get a 4’x2’x6′ tent, will this be enough space for 2 plants? (2 sq. ft. per plant) If so, will these 2 plants yield what we need? I ask this because we have 3 plants in the closet that yield around 4 oz combined. I am currently growing in a 4’x2’x4′ grow tent with two 250W lamps and air cooled reflectors. My plan was using a 400W lamp, but when I checked light intensity with a luxmeter I realized that light distribution was better with two smaller lamps. Still, and since a 400W light produces more lumens than a 250W, you won’t have major issues regarding this. The number of plants depends on growing systems and techniques: you can use the SOG technique and put about 12-16 plants in your space, or you can grow larger plants and use 2-4 plants (SCROG technique). It is up to you, each systems has pros and cons. As you can see, yields do not depend on the number of plants used, but on their size: the idea is always covering the whole growing surface with buds. One question I’ve recently started growing I’m just wondering is it normal for water to be at the end of my tent from the steam or should I dry it? I don’t know if I understood your post correctly. When you say at the end of the tent, you mean you have water condensated on the walls of the grow tent? Or is the water not coming from condensation but from a humidifier? If you have water drops on the walls of your tent caused by condensation, that means you should improve your air extraction system. If it comes from a humidifier, simply adjust it so it produces less vapor. Need help the leaves on the end of my plant have turned yellow and it’s not because their dry I have checked that just wondering what else coul it be and what can I do to help? If you mean the lower leaves of the plant, then you need to add more nitrogen to your nutrient solution. Using any fertilizer formulated for the growth stage should solve the problem. On the other hand, if you mean the upper leaves it could be caused by the heat emitted by the bulb. Placing it a bit further from the plants should lower the temperature of their tops and allow plants to grow normally. My plants have also got purple lines going up true them does this mean they are stressed someone give me tips I don’t l ow what to do, help?? Check the min/max temperatures inside your grow room, plants normally develop purple hues when exposed to low temps, also if they’re stressed somehow. 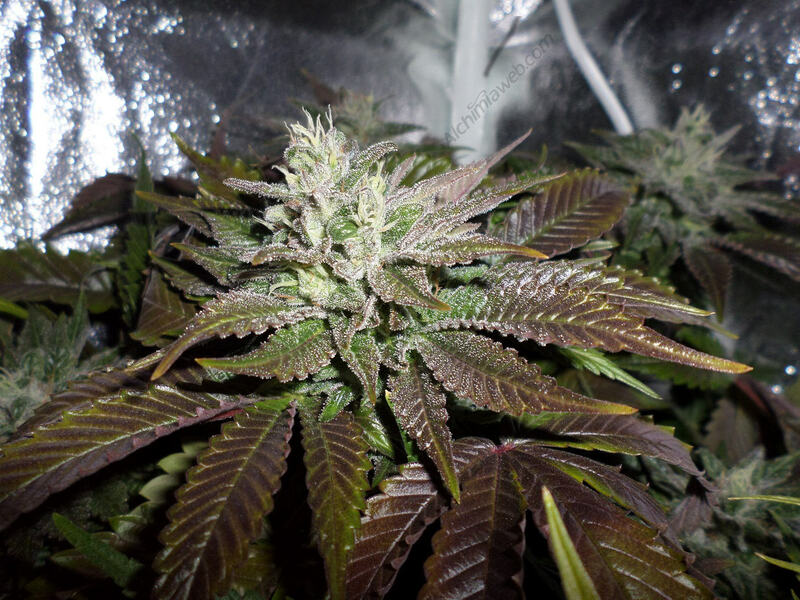 Also, keep in mind that many strains develop purple colors naturally, which is not a problem at all! I just started growing andemand I plan on using the scrog technique. Is it wise to just do this with a 400w Apollo grow light without a tent? Is a tent really necessary for better yield? I’ve been watering my seedlings once every 2 days and I am currently using a 3800 lumen led light for 2 plants. I feel like the light isn’t too imperative this early in the grow stage but once I have the money I do plan on getting the Apollo. With this relatively simple setup will I need a grow tent, good ventilation and temperature for better yield? As you say, light is not so important during the first stages of the plant, but it is imperative to get good yields once into flowering. Grow tents have been designed to keep a good environment for the plants while protecting them from light sources during their night periods. Thus, they’re very convenient but not strictly necessary, especially in regard with yields. What you do need is a good light source (the Apollo 400W would be ok) and proper air renovation in the growing space (and of course controlling the temperature and humidity). These basic tips for indoor gardening should be useful for you. Outside plants receive a decent amount of nighttime light, why do indoor plants have to be in “total darkness?” thank you. Excellent question! Outdoor plants are used to a changing environment, they have sunny days, rainy days, cloudy days, and different moon phases. They adapt to these conditions and react accordingly. On the other hand, indoor plants have much more constant environmental conditions. It must be said that they can also tolerate a certain amount of light during the night period and bloom normally, but it is always better to avoid light sources since indoor plants are more sensitive to environment changes. That’s why complete darkness is always recommended, so you don’t take any risk of stressing the plants. My tent is way to hot I am using a 600watt light with a light cooking reflecter. No matter what I do the tent heats up to over 90. Degrees. Hi, This is a relatively common problem in summer, indeed I know many growers that simply don’t grow indoors during summer to avoid just this problem! I’m not sure what the exterior temperatures are like where you are but one easy step you can take is to change the hours on your timer so the lights go on at night, when the exterior air is cooler, so the ambient temperature will be lower. Make sure your cool-tube ducting (insulated ducting will help lower temps too) is venting to the exterior well away from where you’re pulling the fresh air into the tent, and to make the extraction more efficient, make sure the ducting is as straight and direct as possible, without too many twists and turns which would reduce airflow and make the fans work too hard. Is the ballast for the lamp inside the tent? Can you move it outside? That would certainly help too. If these measures don’t make any difference, then you could look into cooling the tent with something as basic as a bucket of ice, or if that’s too simple, then maybe look into a portable air conditioning unit that you could direct into the tent. I hope that’s some help, happy growing! Im thinking of having perhaps 4 plants in a tent ( making them pretty big) how much Watt do i need on my LED for best grow? Im thinking about roleadro 300W but is it to low for 4 plants i found another one that has 1000W ( all the watt is measured on LED basis) Or does it depends on the size of tent? what size for A good tent for 4 plants, 300w/1000W LED? And regarding the seeds, i have grow Bubblegum before, but i guess now when im doing indoor i should be doing Indica because they will fit better in the tent? or you have sativia strains that does not get to height in lenght? feel free to suggest some strains. I would also need nutrients, soil and all of it hehe..
Let’s imagine a 1,2 x 1,2m grow tent, which would normally require a 600W HPS lamp. 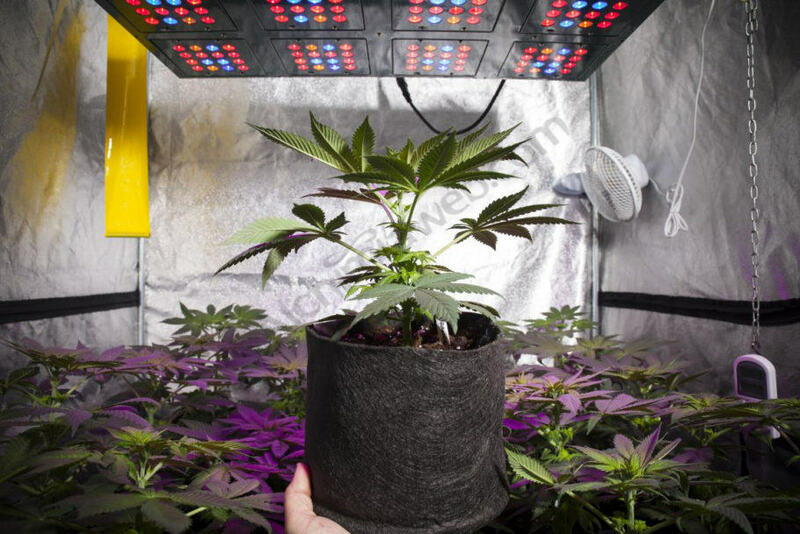 If you can use 2 x 300W LEDs, light distribution will be perfect, much better than if you’re only using a single lamp, and yields will probably be higher than with a standard HPS light. When growing indoors, any pure strain (either Sativa or Indica) is a bit more difficult to grow than hybrids, since in most cases they’re not properly adapted to artificial lighting. Moreover, some pure Sativas are too vigorous and tall for indoor grows, while some pure Indicas take too long to grow and remain too short. For their characteristics, Indica/Sativa hybrids and Sativa/Indica hybrids are the most grown type of strains indoors. About nutrients, I’d suggest to start with something easy. Use some quality soil and slow-release organic nutrients like Biotabs or GH Feeding (Biogrow + Biobloom + Enhancer work great!!!). In this way, you’ll only have to use water + some bacteria to irrigate the plants. Hi Tom, thanks for your question, sorry to hear about your plants dying… those numbers sound fine though, so it must be something else that’s killing them. Without more information on your grow it’s impossible to say what it is, but one of the most common mistakes made by beginners is over-watering, which deprives the roots of oxygen and stunts growth terribly, often killing plants. Allow pots to dry out a little between waterings and get used to the weight of the pots when they’re properly irrigated, that way all you’ll need to do is to lift each pot and if it feels light, it’s time to water! Have a look at our article on watering for some more information on the subject. I hope that helps out, good luck with your next grow, let us know how it goes please! All the best. You should have no problem. I’d recommend you to use a 2-speed fan, so you can switch it in case you need more fresh air inside your grow (which usually happens in summer). Still, you can try with the fan you purchased, I think it’ll work properly. Does it matter where on the tent you attach the in line extractor? We have a tent with holes at both top and bottom. Also, could one vent the extracted air up through a chimney? I have a powerful extractor that used to be part of an extraction set up for a school forge, and the extraction chimney was pretty tall, as I recall…..
Hi, thanks for the question. Ideally you’ll vent from the top of the tent to evacuate any hot air, but it can work fine either way. Venting the air up a tall chimney sounds like a great idea, but I’d still recommend using a carbon filter to avoid the smell being spread over a wide area! All the best and happy growing! I’ve been growing about 15 clones in a horses stable with a 1000w highlider and a 600w. Lights have been on 24/7 for the last 30 days and before that for about 3-4 months with lights on 18 hour a day. What’s the best way to go for setting up for flower? Please help anything will b appreciated. What kind of tents and appliances will I need? Hi Clara, thanks for your question. To set up for flowering you’ll need to create a lightproof space for your plants where they only receive light when you want them to. Without seeing the stable it’s hard to say what to do, some people would put up a quick dry wall to enclose the space but if you’re not that way inclined I’d recommend a grow tent. It sounds like your plants will be quite large after 4-5 months vegetative growth, so I’d recommend a larger tent to ensure they have enough space. Our 240×120 Alchimia Box is a great option. It’s also available as a full kit, including lamps, fans, ventilation and everything else you’ll need, here’s the link: Alchimia Box 240 basic kit. All the best and happy growing! Hi again Ryan, with them being autos, I think I’d go for between six and eight plants in that space. It really depends on the final size they’ll grow to, and while autos tend to be on the smaller side, there are exceptions. Hi Ryan, good choice, I’m sure you’ll do great with those seeds! As far as nutrients go, personally I’d recommend to use organic nutrients from a company like BioBizz or BAC which will provide an easy-to-follow feeding schedule. Alternatively Bio-Technology produce an auto nutrient kit specially formulated for Autoflowering plants. All the best and happy growing! Getting ready to order a tent and start growing. 4×4 And would like yo buy a complete set up. Light, balist, filter, fan all in one shot. Can you recommend any certain brand or how I should go about it? Hi Matthew, thanks for your question. The best thing to do is to check out our selection of Grow Tent Kits, which include all the equipment you’ll need to start growing. We have several kits including a 120cm (4×4) tent, priced depending on the size of bulb you want and how much money you want to spend. If you have any more questions, don’t hesitate to get in touch, happy growing!